When you think of it, the Patrician Brothers have made a major impact on the city of Galway since they came here. This has been particularly evident in the music world of the city — they set up a fife and drum band well over a century ago; they have trained countless choirs down through the years, which in turn led to the formation of the Patrician Musical Society; they have formed many céilí bands, teaching the boys to play the accordion, the flageolet, the mouth organ, the triangle, the drums, and castanets. There was such a demand for these céilí groups at civic functions that the brothers decided to put their best foot forward and form a brass band. This was done 50 years ago under the auspices of their past pupils’ union. The response to Brother Robert’s appeal was terrific, the committee of Tommy Small, Arthur Hurley, and Paddy (Sonny ) Hynes generated an enthusiastic reaction from the parents and business concerns and quickly raised £2,500 (all from donations ) which was enough to buy the instruments and outfit the boys. Under the guidance of Johnny Cox and Brother Albinus, the 33 boys made rapid progress on their instruments. They made their debut at a PPU dinner in March of the following year. By the time the band was 15 months old, they had given 22 performances, as well as two recitals on RTE. 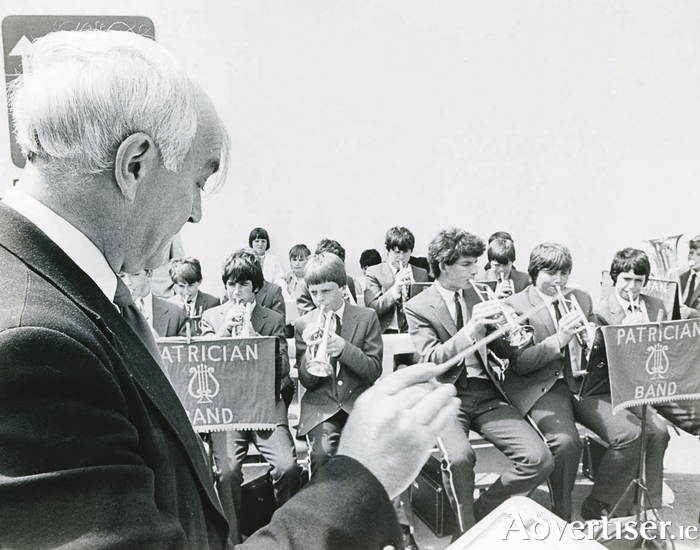 The first members of the band were Ronnie Lawless, Mervue, bandleader; Anthony Burns, Newcastle, cornet; Ronan Tynan, Shantalla, cornet; Richard Cazabon, Mill Street, cornet; Thomas Cazabon, Mill Street, cornet; Gerard Cazabon, Mill Street, cornet; John Flaherty, Mervue, cornet; Raymond Foy, Mervue, cornet; Matthew Heaney, Mervue, cornet; Tommie Naughton, College Road, cornet; Michael Lyons, Renmore, cornet; Thomas Spellman, Bohermore, trombone; Brian Rabbitte, Forster Street, trombone; Thomas Flanagan, Prospect Hill, trombone; Padraig Shaughnessy, Quay Street, trombone; Francis O’Connell, Bohermore, E flat horn; Damien Reade, Shantalla, E flat horn; Gerard Flanagan, Prospect Hill, E flat horn; Seán Maloney, Salthill, euphonium; John Tierney, Woodquay, euphonium; Seán Tomkins, Loyola Place, B flat baritone; Brendan McCarthy, Mervue, B flat baritone; Eamonn O’Carroll, Salthill, double B flat bass; John Grealish, Mervue, double B flat bass; Thomas Doyle, Castlegar, E flat bass; Patrick Lally, Shantalla, E flat bass; Francis Mulveen, Quay Street, side drum; Joseph Walsh, Shantalla, side drum; John Hynes, Newcastle Road, side drum; Gerard O’Connell, Prospect Hill, side drum; Noel Ridge, Woodquay, bass drum; Joseph Geoghegan, Eyre Square, and Robert Hubbard, Renmore, were flag bearers. When Johnny Cox retired, John Merrick took over the training of the band and maintaining its high standards. Our photograph (from the early 1980s ) shows him conducting Michael O’Connor, David Gibbons, Robert O’Toole, John Fegan, Ray Reidy, Ken O’Connor, Louis McLoughlin, John Fleming, Damien O’Neill, and Ray O’Connor. To celebrate their notable anniversary, the band are organising a special concert in the Radisson on Wednesday next, May 10, which will feature performances from the band (including many ex-members ), The Black Magic Band, and the Galway Youth Orchestra. It will be an evening of nostalgia and great musical entertainment celebrating community, Galway, and the brass band. It will truly be a night to remember. Don’t miss it.